Vassilitsa - G. & A. Nousias G.P. 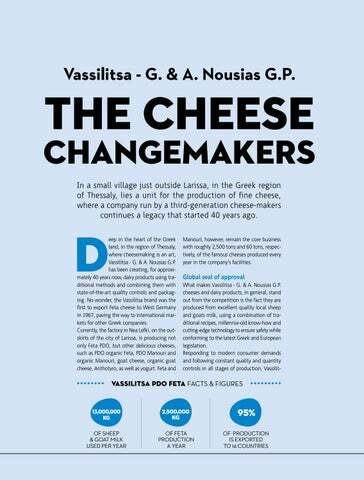 changemakers In a small village just outside Larissa, in the Greek region of Thessaly, lies a unit for the production of fine cheese, where a company run by a third-generation cheese-makers continues a legacy that started 40 years ago. Manouri, however, remain the core business with roughly 2,500 tons and 60 tons, respectively, of the famous cheeses produced every year in the companyâ&#x20AC;&#x2122;s facilities.